One of the most celebrated Dutch landscape artists of the nineteenth century was Barend Cornelis Koekkoek. His works were typical of the period’s landscape painting, which combined “a romantic feeling for nature with a classically inspired manner, so that even when nature assumes dramatic form in the guise of a gathering storm, the brush is unmoved. Koekkoek became a much sought after artist through his mountainous, forest and idyllic woodland scenes, as well as his majestic oak trees, gathering thunderstorms, and masterful use of light. Barend Cornelis Koekkoek was born in 1803 in Middleburg, the Netherlands into a family of artists. He received his first art instruction from his father, Johannes Hermanus Koekkoek (1778-1851), a well-known marine artist, and studied with Abraham Kraijestein (1793-1855) at the Middleburg Drawing Academy. In 1823, the young Koekkoek enrolled at the Royal Academy of Fine Arts in Amsterdam after being granted a scholarship of 300 guilders for three years by King Willem I. He studied there with Jan Willem Pieneman (1779-1853), mostly known for his contemporary history scenes of the Kingdom of the Netherlands and for being a teacher to an impressive group of artists, as well as with Jean Augustin Daiwaille (1786-1850), the portrait painter and lithographer. In 1833, Koekkoek married Elise Thérèse, the daughter of Jean Augustin Daiwaille, his former instructor at the Art Academy in Amsterdam. A year later they moved to Germany and settled in the town of Cleves, located in the hilly woodlands close to the Rhine basin. From there, he made annual summer expeditions to other parts of Germany, Belgium and Luxembourg, and brought back many sketches, which he used primarily as studies. However, unlike his fellow artists, Koekkoek did not reproduce these studies rather he used them as an indirect source of inspiration. During the 1830s, he continued to study nature in order to perfect his style, and painted a number of scenes of the Rhine, of winter scenes and of “the first densely wooded landscapes that were to establish his fame.” (van Heteren, Jansen, and de Leeuw, pg. 74) While he based his style on that of seventeenth-century Dutch artists like Meindert Hobbema (1638-1700), Jan van Goyen (1596-1656), and Jan Wijnants (c.1635-1684), some of his early paintings also recall the works of his contemporary Andreas Schelfhout (1787-1870) such as in Winter Landscape with Peasant’s House and Frozen Canal (1837; Haarlem, Teylers Museum). 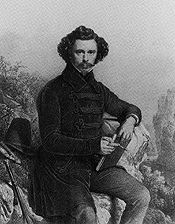 Koekkoek reached the peak of his fame in the early 1840s. He gained international recognition in 1839, when he sent a large Woodland scene to exhibitions in The Hague and Paris. In 1841, he published a book entitled Thoughts and Recollections of a Landscape Artist (Herinneringen en mededeelingen van eenan landschapschilder), in which he gives an account of one of his art trips down the Rhine, and describes his thoughts about the ideal landscape art. That same year, he was proclaimed the Prince of Landscapists. (van Heteren, Jansen, and de Leeuw, pg. 87) From that time, Koekkoek received an increasing number of commissions from many distinguished patrons such as King Willem II of the Netherlands, Tsar Alexander II of Russia, and King Friederich Wilhelm IV of Prussia. With the high demand for his work, forgeries began to appear in the market, as a result, he stared issuing certificates of authenticity by 1847. Koekkoek was a prominent figure in the art world during his life and after his death. In 1841, he founded a drawing academy in Cleves where many young artists went to study with him, and established in 1847 a local society to promote the appreciation of arts. His grand residence which he had built in 1848 for his family became the Städtisches Museum Haus Koekkoek in 1960 holding many of his paintings, studies and drawings. During his lifetime, he exhibited regularly in The Hague, Rotterdam, Amsterdam and Paris where he won medals in 1840 and 1845. Koekkoek also received numerous honors and was awarded the Netherlands Order of the Lion and the Belgian Order of Leopold. Städtisches Museum Haus Koekkoek, Cleves, (Germany).